Throwback to the 2017 season where Team Captain Rachael DeLong, ‘19, completes another at-bat. After a year of absence from the diamond, the Girls Varsity Softball team is back and is in full throttle. The team was without a pitcher last year, so there was no team. But this year Autumn Mish, ‘21, is in the pitching circle. And, despite the gap year, the team crushed Hamden Hall in their first outing, 16 to 1. Autumn pitched three innings with only one hit and run allowed with six strikeouts. In addition to having a strong pitcher and making her stronger, Coach Omaña has set goals for his other players. Rachael DeLong, ‘19, is back as the team captain and catcher after the hiatus year. Rachael was one of two returning players from the 2017 softball team. Despite the gap year, she plans on bringing her leadership and softball capabilities to the table by helping to build the team. First baseman Kate Grissmer, ‘20, came back and is excited for this season and the one to come. 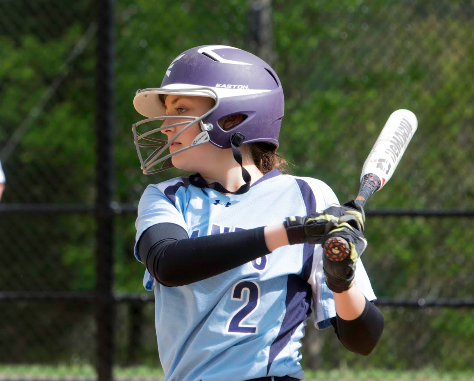 Kate hit two out of three at the plate while racking in two RBI’s. And she had high praise for new shortstop, Abby Mitchell, ‘22. Kate said she “showed experience” in her throws and at the plate. Abby went three for three at bats with two RBI’s. The team is looking to stay in form when playing a strong Taft team on Saturday, April 13.